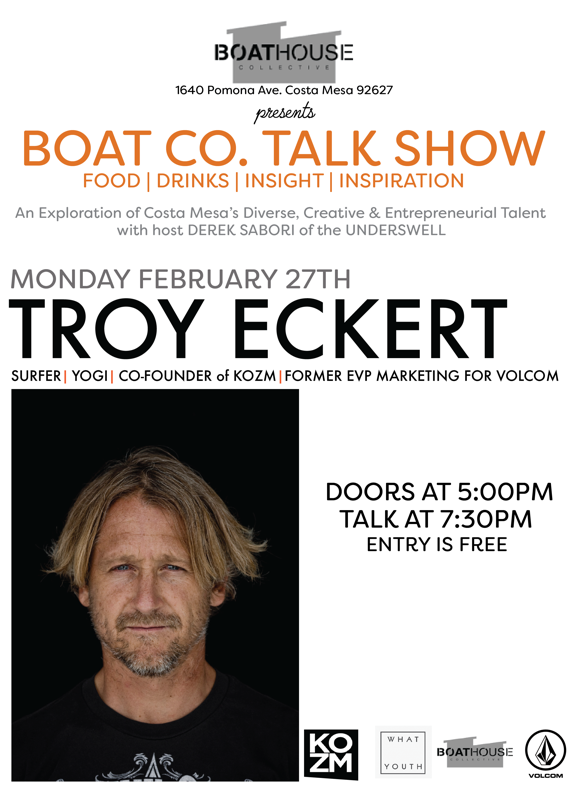 Join Boat Co. Talk Show Host Derek Sabori in a candid and personal deep dive discussion with action sports pioneer, turned entrepreneur Troy Eckert, former EVP of Global Marketing at Volcom, and Co-Founder of the men’s yoga brand, Kozm. About Troy: Troy started his surfing career, during his high school years, with a sponsorship from the surf brand Quiksilver. During that time he was selected for the NSSA National Team where he traveled and competed at the country’s highest level. Shortly thereafter, Richard Woolcott, his long time team manager, quit Quiksliver and started a company called Volcom. At the age of 18, Troy was quickly recruited to the company as its 3rd employee, and the rest, as they say, is history. Working any and all jobs - from shipping to production to marketing and everything in between - Troy finally found his niche in marketing and spent the next 20 years at the company working his way up to Executive Vice President of Marketing, where he managed the company’s sports programs and marketing campaigns. In 2011 Troy and Volcom parted ways and for the next 5 years he spent his time surfing and working as a consultant and sports agent to select professional surfers. In 2015, after years of fine tuning a yoga practice, and noticing an opportunity in the market, Troy decided it was time to give it another go and co-founded the men’s yoga brand Kozm with long time friend and ex Volcom co-worker Derek Sabori. Troy calls San Clemente home and can be followed at @treckert. Full bio on linkedin.com. About The Boat Co. Talk Show (BCTS): The BCTS is a monthly exploration of the diverse, creative and entrepreneurial talent that resides right here in our backyard. The show’s goal is to contribute to a better world, starting with our own community, by inspiring future leaders with stories of positivity, perseverance, and hard work. It’s an hour that will entertain, uplift, challenge convention, provoke thought, and stir emotions. With a focus on the personal journey, host Derek Sabori takes a living-room-chat approach to get the stories that matter, and to draw out the insights that can help professionals and students of all ages as they craft their own career, and personal life, trajectories. Schedule: Doors open at 5pm, dinner served from 5-7. Talk begins at 7:00pm. Cost: Free. Food & beverages available for purchase. More info available at www.boathousecollective.com.